Dobson says highlights in the past year include the resurgent Hit network, “Fox FM in Melbourne being the most listened to station in Australia”, and RnB Fridays success as an album and a live tour. Nova Entertainment program director Paul Jackson said there have been many success stories at a station level for Nova in the past year. "So the collective network position of number one and record cumulative audience and share reflects the strength of the brand around the country. Within that, I have to say Coldplay performing for Nova’s Red Room, not once but twice, is an incredible achievement that only Nova can pull off." Jackson adds Smooth winning half of the surveys as the number one FM station in Sydney is "a wonderful achievement". He adds: "The calendar year may come to an end but we're very conscious that our listeners expect the best from us all year not just in ratings periods. We have very strong line ups over the Christmas period and a variety of event shows such as Guy Sebastian on Nova and Richard Wilkins presenting drive for a couple of weeks on smooth." ARN national content director Duncan Campbell says all surveys are important to give the industry currency and provide indicators that help shape the ongoing strategy for each station and show. "Survey eight gives you a final look at how effective these have been over the year and, although plans are already in place for next year for stations and shows, it’s a final chance to make any amendments based on those last results for the year," Campbell adds. "There are a number of highlights across the ARN network, however if we were to choose a standout it would be the number of times our stations have gone #1 in Sydney, Melbourne, Brisbane and Adelaide and the ongoing dominance of the Kyle & Jackie O Show in Sydney breakfast." SCA’s chief sales officer Brian Gallagher says the network's sales teams have been in market taking about the strengths of its radio brands after a ‘stellar year of ratings’ ahead of today's numbers. “We had fantastic results across our regional markets as well with the introduction of 24 new surveyed markets in 2016. SCA has ensured our agency partners have the tools in place to utilise those regional surveys and we expect great outcomes,” Gallagher says. ARN's Campbell says media agencies and clients access a range of survey data and look at a combination of historical data and most relevant survey periods in addition to the latest survey results. "Understanding the trends in listening and audiences numbers are critical to ensuring we provide them with the most comprehensive data set and overall picture available," he adds. Nova Entertainment group sales director and acting COO Peter Charlton says the last two weeks of the year post today's final survey are usually really busy with the laying down of Q1 investment. "The immediate and flexible nature of the medium means that there is usually a rush to secure inventory in Q1. The demand for radio has been so strong across the last two years that it is prudent to book as early as possible," Charlton says. "Due to the strong attribution of the medium, high demand and the sophistication of integrated (native) responses, more and more business is being booked early." Charlton adds that the success of Smooth in Sydney has given the station a strong profile in the advertising market. SCA's Dobson says the network’s main challenge for 2017 will be the rise of Sydney breakfast, maintaining dominance in Melbourne and "making sure he can grow a decent beard". Strategy-wise, Dobson says apart from instigating summer programming for the holiday season when time spent listening lessens, all major changes for the survey year to come have been done. “Every day is a survey day is our mantra. We try to put our best foot forward at all times,” he says. For Noval's Charlton, the challenge will be harnessing, measuring and selling across all consumer touch points. "Radio audiences are as strong as ever due to the many ways a mobile consumer interacts with our brands (multiplatform , often digital) . With a social audience bigger than a listening one some clients are tapping into our expanding opportunities but not all and some are definitely stealing a march. As these audiences for us become addressable in the new year this should help accelerate investment in all our platforms." For Campbell, the challenge for 2017 is a no brainer: "A key challenge in 2017 is maintaining consistency in leadership positions across all key markets." While Kiis 106.5's Kyle and Jackie O continued their dominance of Sydney breakfast radio on FM with a share of 10.5%, at the other end of the spectrum 2DayFM's Rove and Sam has continued to fall, shedding 1.3 points to a share of 3.8% in the final ratings survey. WSFM's Brendan Jones and Amanda Keller were the big risers, gaining 1.7 points to a share of 8.7% to finish the year in second position on the FM band. Nova 96.9's Fitzy & Wippa climbed 0.7 points to 7.1% followed by Smooth FM'S Bogart Torelli and Glenn Daniel on 6.7%. 2GB's Alan Jones had the largest overall share on breakfast radio with a 14.5 % audience share, despite a 2.4 points. In the prime time drive slot, Nova’s Smooth FM has been overtaken by Kiis’ Hughsey and Kate, who now move into the top position with an audience share of 9.5%. Smooth FM and Nova’s Kate, Tim & Marty are now tied for second place, with 9.1% audience share each. 2GB continues to win the overall total listening across Sydney with 11.3% of the audience share, down slightly from the last survey. SCA station 101.9 Fox FM continues to lead the pack in Melbourne, according to the latest round of quarterly radio ratings. Up 0.5 percentage points, it commanded a listenership of 10.6% of the total radio market. SmoothFM trails slightly behind with a 9% audience share, despite a list of 1.4 percentage points. In the talk radio wars, 3AW storms ahead with a 13.7% audience share, versus nearest rival ABC774 with a 9.6% audience share. Similarly, Mebourne's breakfast and drive shows are domainated by 101.9 Fox FM. In drive, Hamish and Andy gained 1.5 points to a massive 14.8% audience share with Smooth FM in second with a 8.2% share. SCA will have a huge hole to fill when the duo leave radio at the end of 2017. Southern Cross Austereo's Fox FM has taken line honours in terms of the station with the largest radio audience in Australia in the final radio survey of 2016. 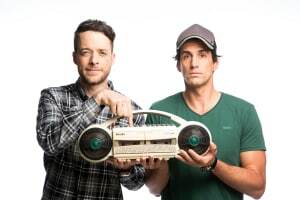 The station has 1.1 million listeners, which is 233,000 more than its nearest rival, and its success is being led by popular drive time pair Hamish and Andy, who end they year with a whopping 14.8% share in Melbourne's drive time. However, Nova Network is the most listened to network across the country with 3.25 million listeners aged 10 and older. Nova 96.9 is the most listened to station in Sydney with 944,000 listeners, while Smooth FM has rated well in audiences aged 25 and above. Another major success story has been the dominance of ARN station Kiis in Sydney, in particular Kyle and Jackie O's dominance of Sydney breakfast radio, winning most surveys including the final one with a 10.5% audience share. Meanwhile Hughesy and Kate have won drive with a 9.5% share. At the other end of the spectrum, Rove and Sam's woes continue in Sydney as the duo lose even more ground to finish the year with a 3.8% share (see full results below). The final survey holds some weight as it carries the networks until March, when the first ratings of the year are delivered. SCA chief creative officer Guy Dobson says: “Any time you get judged by the public is important. It’s always nice to go into the long break with a good set of figures in the bank. Survey one results are not until March so you wear your result for a while."